Native to southern India and Sri Lanka, Indian ringnecks have successfully introduced themselves into other areas around the world including the U.S., South America, Europe, Japan, Australia and Africa. As such, their breeding seasons vary with the climates of their introduced range, but it typically falls during the U.S. winter. Unlike many other parrots, Indian ringnecks aren't monogamous and may have several mates over the course of their lives. Their breeding behavior is similar to that of many other species. Indian ringneck parakeets range between 14 and 17 inches long; approximately half of their body length comes from their long tail feathers. They get their name from the thin black chinstrap that wraps around the necks of males. In the wild, these medium-sized parrots are most typically bright green with accents of yellow or bluish-gray, but captive parakeets come in more than 30 different color varieties as the result of breeding. Young ringnecks look very similar to their parents, although their colors are less brilliant than those of adults. In the wild, these colorful parrots typically breed between February and March, although this season is slightly extended in some cases. In introduced areas, however, the breeding season will vary depending on the climate. For example, Joyce Baum, a seasoned ringneck breeder who lives in Arizona, mentions in one of her articles that her ringnecks typically start working their nest box in December. The breeding season doesn't only encompass the physical act of breeding, but also courting, finding a suitable mate and choosing a suitable nesting cavity. 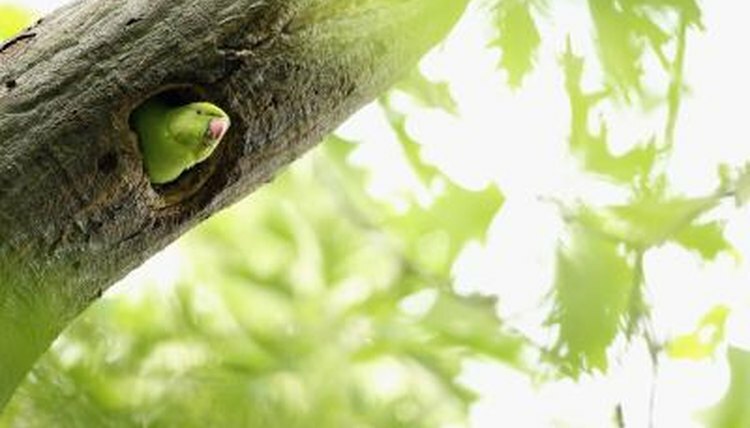 Indian ringnecks prefer the opportunistic approach to finding a nesting cavity. Old holes previously excavated by woodpeckers or barbets work well for these medium-sized birds. Holes in the walls of a building also will work for these opportunistic nesters. The ideal cavity entrance should be typically around 2 inches or more. If they don't find a proper cavity or nest box, ringnecks will excavate their own using their powerful beaks and claws. Females typically lay an average clutch of between two and six small, whitish eggs. For the three weeks after laying, she incubates her eggs. Once the young hatch, both father and mother take turns caring for their young. According to the Royal Society for the Protection of Birds, Indian ringnecks experience high nesting success. The young fledge when they are between 40 and 50 days old; they're sexually mature between 1 and 1 1/2 years old.